SERMONS AND SACRED PICTURES profiles Reverend L.O. Taylor, a Memphis-based Baptist minister who in the 1930s and 40s built a fiery reputation by lacing his sermons with parables, fables and dramatic visual descriptions. 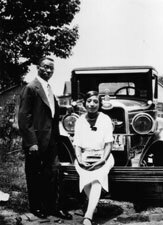 Taylor was also an inspired photographer and filmmaker with a keen interest in preserving a visual and aural record of the fabric of black American life. He photographed and filmed businesses and schools, the National Baptist Convention, baptisms, funerals, and individuals in the quiet dignity of their everyday lives. Over the years he compiled an extraordinary record of Southern black life before the Civil Rights movement. This film is an innovative combination of Taylor's films and audio recordings, images of contemporary Memphis, and commentary by his widow and others who knew him, forming an intertwined narrative about the pioneering documentarian and social activist. Taylor emerges as a man of humor, piety and intelligence, vibrantly involved in the community he loved.